What is a Green Christmas? 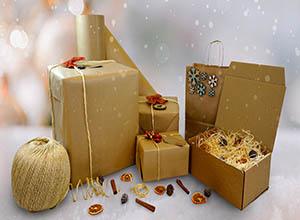 This Christmas, ukpackaging.com are making an effort to be more eco-friendly. As a packaging company, it is part of our duty to sell and promote environmentally friendly items wherever possible. Last month, we launched our Eco-Packaging collection, a selection of our most eco-friendly products designed to help our environmentally conscious customers find our greenest products with ease. This is a collection that we hope to expand in the future in our bid to reduce plastic pollution. Part of our Green Christmas effort has been the promotion of our Kraft Paper, Kraft Paper Tape, Recyclable Paper Bags, and Sisal Twine, as Christmas Wrapping Products to encourage our customers to think about eco-friendly alternatives to traditional Christmas wrapping. Wrapping Paper – Flocked, glittery, or foil wrapping paper cannot be recycled, and yet is commonly put in the recycling bin. Not only can these products not be recycled, but their presence in your recycling bin can render not just your recycling, but the entire load, useless. Many wrapping papers also have sticky tape attached which makes it more difficult to recycle, and many are dyed, laminated, or contain other non-paper items. Our Kraft Paper is 100% recyclable, biodegradable, compostable. The best way to test if your wrapping paper can be recycled is what RecycleNow refer to as the 'Scrunch Test' - "if it scrunches, it can be recycled". Cardboard Boxes – Many Christmas gifts this year are likely to come with cardboard. Cardboard boxes and envelopes are widely recycled and easy to breakdown, providing any embellishments have been removed. Most cardboard boxes are also easy to reuse to either package future items, or for more creative endeavours. We stock a wide range of cardboard boxes which fit gifts of any size, and are strong enough to be used again and again. Christmas Cards – Most Christmas cards are made from paper and both they, and their envelopes, can be recycled. However, many also have glitter and other non-recyclable embellishments attached, and these items, or the areas that contain them, should be removed and put into the household rubbish bin. Batteries from musical cards should be removed and taken to a battery recycling point. Christmas Trees – Real Christmas trees can be recycled via your local recycling centre, or a drop-off point (depending on your local authority). Fake Christmas Trees should be reused for as long as possible. Tinsel – Tinsel cannot be recycled at all. Baubles – Unfortunately, glass baubles can’t be recycled and, if broken, should be wrapped up and placed in the rubbish bin. Plastic baubles are also not widely recycled. The best thing to do with your baubles is to reuse them. Christmas Tree Lights – These are another item which are often best to be reused, but they can be recycled. The best way to recycle your Christmas tree lights is by taking them to your local recycling centre, however some council will now collect them providing they are bagged and separate from your other recycling. Wreaths – Only natural wreaths without glitter can be recycled. To recycle, remove any artificial decorations (either save them to reuse them or put them in the rubbish bin) and place the greenery from the base directly into your garden waste bin. Plastic wreaths are best to be reused. Christmas Dinner – The best thing to do with Christmas Dinner (aside from eating it) is to recycle any packaging you can (always check the box) and either compost the solids yourself (except cooked foods), place them in your kitchen food caddy, or add them to your garden waste. A guide to recycling food waste can be found here. A great guide to your local recycling options can be found via RecycleNow. How Are We Having a Green Christmas? Reused any boxes that our purchases have arrived in. Used Paper Void Fill, Globular Embossed Paper, Wood Wool, Biodegradable Loose Fill, or Tissue Paper, to protect our presents. Used Kraft Paper and Kraft Paper Tape to wrap our presents. Used Sisal Twine, Cotton String, and other natural materials to decorate the presents. Used our Reinforced Card Tags to label presents. Given our presents in Recyclable Paper Bags. We are also reusing all of our Christmas decorations.